31 Grade Eleven students and four teachers from the Prem Tinsulanonda International School embarked on a unique and ground-breaking project. They spent a week at the Paulong hill tribe village of Ban Pang Daeng Nai near Chiang Dao, constructing check dams and preparing an agro-forest trail. 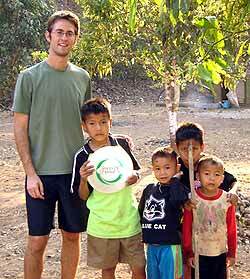 Ajarn David with hill tribe children after introducing them to the world of Ultimate Frisbee. The origins of the project can be traced to the efforts of His Majesty King Bhumibol, who launched an initiative to build check dams throughout Thailand, and in this case, over 30,000 in the Chiang Mai province. Villages suffer from low water levels in the dry season, and His Majesty’s proposal serves to meet the need of keeping usable quantities of water throughout the year in rural Thailand. On the first day of dam-building, villagers and visitors from Prem went to the local school, which served as a marshaling area for 600 Thai students who were trucked in from the surrounding area. After the opening ceremony, Prem students helped to divide the Thai schoolchildren into 100 groups, each with the responsibility of completing one check dam. These dams were to be constructed along a two kilometer stretch of stream that runs from the surrounding mountains through the village. 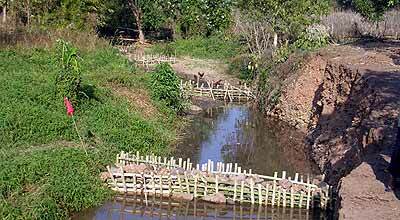 The finished product of a hard day’s work - bamboo check dams dot the village stream. All the dams were built simply, yet effectively, using natural materials. Workgroups sharpened bamboo poles with machetes and then hammered them into the ground in two parallel lines. Longer bamboo poles were then laid horizontally across the river bed and lashed to the vertical sticks using, once again, bamboo strips. The newly formed frame was then filled with rocks, dirt, and sandbags. With a hard-working team, one dam could be completed in an hour. 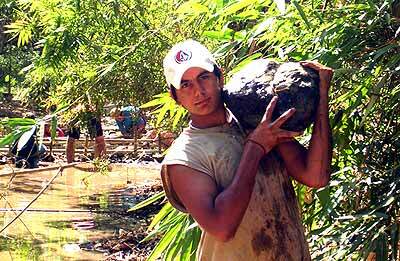 Prem student Alex carries a boulder to strengthen the dam at the village of Ban Pang Daeng Nai. Two groups of Prem students and teachers spent three days each at Ban Pang Daeng Nai. They lived in bamboo huts, ate communal meals outdoors, and worked side by side with the villagers. Under the guidance of Track of the Tiger tour company, which has a close relationship with the village and is working to promote “volun-tourism” in the area, Prem was the first school to work with the people of Ban Pang Daeng Nai in such a capacity. After completing one of 100 check dams, Prem students enjoy the afternoon with some of the village children. The first group of Prem students built most of the dams, and then surveyed an agro-forest trail to mark spots for improvement. When the second group came in, they fortified the dams with extra sandbags and stones. After completing this, they built bamboo railings and bridges on the trail and carved out steps in the mountain dirt. Ajarn Janet and her students get down and dirty during their dam construction with hill tribe villagers. Students not only worked with the villagers, but lived with them as well. After a day of lifting sandbags in the hot sun, Prem’s Grade Eleven returned to the village to play games with the children of Ban Pan Daeng Nai, teaching them how to play baseball. For everyone from Prem, it was an all-encompassing experience. Although only an hour’s drive from Mae Rim, this village was a world away. One student, Nick Laine, remarked, “I never felt like an outsider. The Paulong people were extremely friendly, helpful, and welcoming.” Being one of the staff members on the trip, I felt that the most rewarding part of the experience was working on a task from start to finish with people who are from such a different background than our own. Getting sweaty, muddy, and lifting sacks of stones together is being human together. Life’s lessons aside, these 35 members of the Prem community worked for one special week to bring vital water to a community here in the Chiang Mai province. According to student Kinga Tshering, “It gave us immense pleasure to help the villagers in our own small way.” That is certainly something of which to be proud. The third performance of the 2005 Chiang Mai Classics concert series will feature Pitijet (Xavier) Vichitporn. A native of Chiang Mai, Vichitporn has performed for Their Majesties the King and Queen of Thailand, and for other members of the Royal Family. He has performed professionally with the Belgian and Dutch symphony orchestras, and is widely regarded as one of Chiang Mai’s foremost international musicians. In 1997 he was appointed as a member of Roosendaal Symphony Orchestra in the Netherlands, and in 1998 he became a member of Belgium’s Royal Flemish Conservatory Symphony Orchestra of Gent. The Magic Duo together with the Symphony Orchestra: Ajarn Xavier Vichitporn and Judith Utley with her harp. 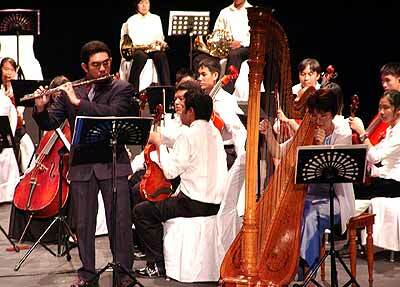 Many Chiang Mai music lovers will remember his outstanding solo performance last October with the newly-established Chiang Mai Symphony Orchestra at Kad Suan Kaew Theatre. He will return to the same stage on Saturday, March 12, 2005 where he will join fellow musicians Annop Ruangmanee and Judith Utley in a Trio Sonata for Flute, Viola and Harp by Debussy and the Terzettino for Flute, Viola and Harp by Theodore Dubois. Vichitporn’s love of music began when he was very young and joined Montfort College School Band in 1983. He studied flute and piano at Chiang Mai’s Payap University, from which he received a Bachelor of Arts in Music in 1994. He also studied at Trinity College of Music, London, and with renowned instructors in both Belgium and The Netherlands. He began to combine public performances with a teaching career in 2000. Vichitporn has held appointments at Chiang Mai School of Arts and Music; Chiang Mai University; the Art and Music Centre Chiang Mai University Art Museum; First Church Community Choir; Mahidol College of Music; Nakorn Payap International School; and Chiang Mai Choral Society. 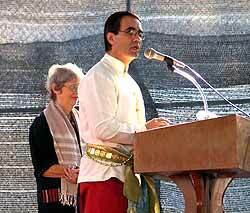 In 2003 he co-founded Baan Chulasai Music and Arts School, Chiang Mai which specializes in teaching disadvantaged children. Tickets and program information are available at Rimping supermarkets, Amari Rincome hotel, The New Life Foundation and Kad Suan Kaew’s Information Counter or by e-mailing [email protected] xinfo.co.th. The Thai Department and Thai Parents Association of Chiang Mai International School (CMIS) organized the school’s biennial “Thai Day” on Thursday, February 24 with great success! 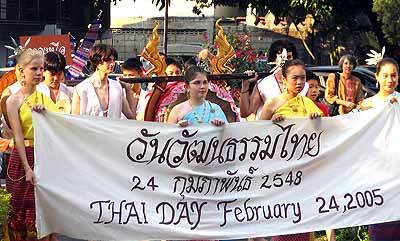 This celebration of Thai culture was an opportunity for students and parents to learn about and appreciate the diversity of the country in which we live. CMIS Principal Terry Gamble and Board Chair Heather Smith. The morning began with a parade welcoming guests to the event, complete with gongs, drums and cymbals. Each of Thailand’s four regions was highlighted in the presentation. 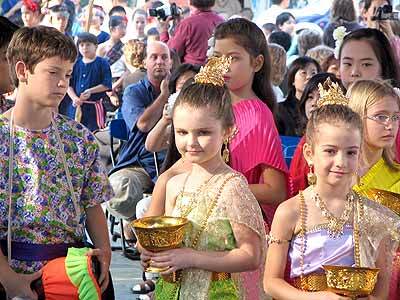 Almost the entire student body was dressed in traditional Thai costumes, and every elementary class was involved in at least one stage performance of a Thai song or dance. Thai food stalls and hands-on craft centers were the focus of attention during the afternoon, and a Thai “village” was set up on the CMIS soccer field where students could test their skill at traditional Thai games, such as climbing greased bamboo poles! The teachers, parents, students and other volunteers who mounted this wonderful event deserve hearty congratulations and thanks! Well done! Grade 3 students in costume.